Twitter has been buzzing with tweets about Priyanka Chopra and Nick Jonas. After months of are they, are they not, Priyanka Chopra and Nick Jonas have finally made their relationship official on social media. Both Priyanka and Nick posted the same picture on Instagram. "Taken.. With all my heart and soul.." wrote Priyanka about an hour ago. Nick, on the other hand, wrote this: "Future Mrs. Jonas. My heart. My love." Both posts have collected thousands of hearts from their Insta followers. In fact, even before Priyanka and Nick announced the news on Instagram, social media couldn't keep calm and carry on. Pictures of the couple from their roka ceremony began circulating online before the official announcement from the couple. Twitter too has been buzzing with tweets about the couple. 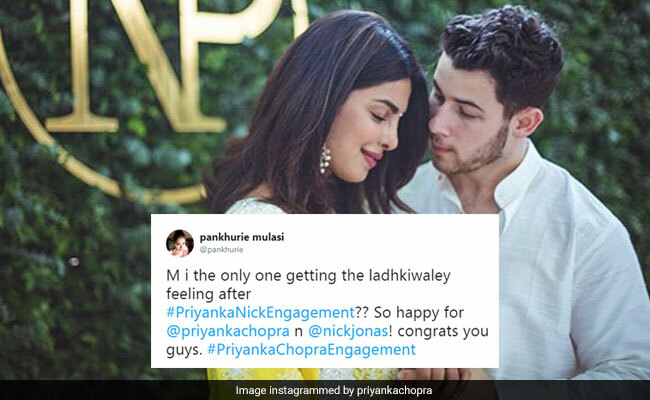 Along with #PriyankaNickEngagement, #PriyankaChopraEngagement and Nick Jonas have been trending on the micro-blogging site. Here are some of the best reactions on Twitter. The couple's roka ceremony was attended by Priyanka's cousin, actor Parineeti Chopra, Salman Khan's sister Arpita, among others. Nick's parents Denise and Kevin were also seen in pictures from the ceremony. They flew to Mumbai on Thursday. Priyanka Chopra and Nick Jonas will reportedly hold an engagement party in Mumbai in the evening today. The guest list will likely include Priyanka Chopra's Dil Dhadakne Do and Bajirao Mastani co-star Ranveer Singh and filmmaker Karan Johar.